On 4 July Judge of the Salihorsk District Court Valiantsina Lapina turned down the appeal of a “Young Front” activist Andrei Tychyna against the prohibition of a bicycle rally, issued by the Salihorsk City Executive Committee. The Brest Regional Court confirmed the ruling of the Leninski District Court of Brest concerning the ban of a series of pickets under the slogan “Freedom to Political Prisoners!” by the Brest City Executive Committee in autumn 2011. 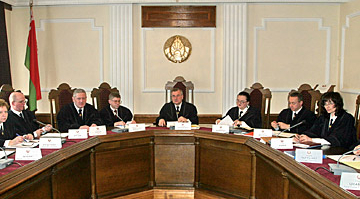 On 12 January Siarhei Shytsikau, Judge of the Tsentralny District Court of Homel, turned down the appeal of the Homel human rights defenders Anatol Paplauny and Leanid Sudalenka against the refusal of the Homel City Executive Committee to authorize their picket, dated to the Human Rights Day, 10 December. On 16 October the Brest human rights defender Raman Kisliak planned to hold a one-man procession on Kasmanauty Strip in Brest in order to draw the public attention to violalion of the right to freedom of the vice-President of the International Federation for Human Rights, chairman of the Human Rights Center “Viasna” Ales Bialiatski. On 13 October the Chyhunachny district court of Homel tried 7 pro-democratic activists. As BelaPAN informs, on 16 September 16 oppositionists planned to hold a rally of solidarity with the families of the abducted, but were detained by police on their way to the place where the event was held. As a result, the rally hadn’t taken place. The human rights defenders of Baranavichy seek to stop the disgraceful practice of banning mass actions by the local authorities. Siarhei Housha, Karnei Piatrovich and Viktar Syrytsa prepared an address to the prosecutor’s office of Baranavichy district concerning the ban of a picket to them. On 14 October the head of Homel branch of the For Freedom movement Uladzimir Katsora addressed Homel oblast prosecutor’s office with the demand to instigate a criminal case against the police officers who had drawn up on him deceitful reports following his detention on 16 September. Later Katsora and some other democratic activists of Homel were fined by court on the basis of these documents. On 7 May people were detained in Mahilou at a concert played by Lyapis Trubetskoy, while the musicians were singing the song Belarus Freedom. As said by the lawyer of the political prisoner Pavel Sapelka, Mikalai Autukhovich calls on the people who are keeping the hunger-strike of solidarity with him to stop it. He thanks everybody for the support, but says that their health and youth are necessary to continue the struggle for democracy. Adherents of the For Freedom movement have received a negative answer from Brest oblast executive committee to their proposal to abolish the ruling of Baranavichy city executive committee About the rules of holding mass actions in the city of Baranavichy. The result of the today’s meeting of entrepreneurs was that the Mahilou region executive committee suspended operation of a regulation of the region council on single tax and value added tax increase. ‘Our heartiest congratulations on the Constitution Day!’ – this is what many Homel residents heard on 15 March. Homel Thsentralny Borough Court sentenced Kastus Zhukouski to 7 days of arrest for participating in a Mother Language Day action in downtown Homel. Vasil Takarenka, Marysia Tulzankova and Ales Viartseika were fined BYR 700,000 each. The teenagers were standing in the center of Homel holding posters with the words ‘Mother Tongue’ and a Russian phrase ‘Banned’ across. Their mouths were covered with green and red ribbons. NB: International Mother Language Day, celebrated annually on February 21, aims to promote the recognition and practice of the world’s mother tongues, particularly minority ones. On 14 February 2008 the unregistered Young Front organization conducted a peaceful youth demonstration. A rally of solidarity with political prisoners was brutally disbanded in Minsk on February 16. 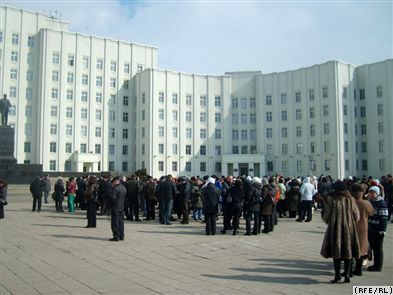 Dozens of Minsk dwellers were beaten up by policemen and riot policemen on October Square in Minsk. On February 16, on the Day of Belarusian Solidarity, opposition leaders and activists, former political prisoners and common Minsk dwellers came to October Square with portraits of the arrested Mikalay Autukhovich, Yury Lyavonau, Uladzimir Asipenka, Artsyom Dubski.